Krishnarjuna Yuddham - Nani's third attempt to present two characters in one film throughout has been good. The analogy of kurukshethra war where Krishna guided Arjuna to victory has been altered as such in this movie where Arjun's character is shown as the planner/guide and Krishna's character as the executor/doer. 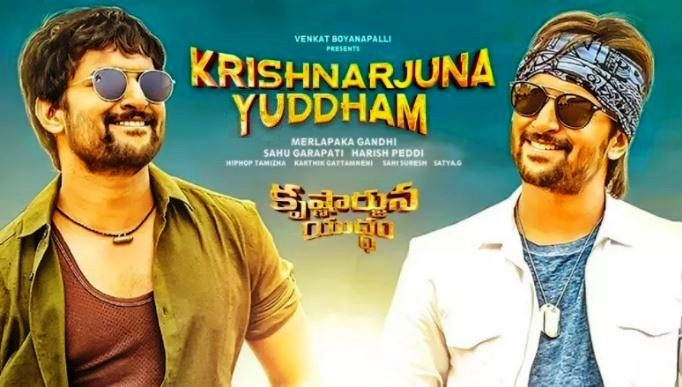 Nani has performed the happy-go-lucky villager role of Krishna with great poise and the other role of a rich rock-star Arjun is fine but needs refinement. The spark and swag of a rock-star are not igniting and inspiring. The songs have been dull and the music is ineffective, especially not supporting the rock-star image. First half has been too long and does not make the focal point strong. Comedy tracks have been short but script has been on dot. The village nativity has been captured quite beautifully including the party song and dance which are situational. Second half gets serious about the actual business and the screenplay has been good with connectivity maintained. Climax has been simple and sweet with Nani as Krishna generating enough heat to beat the opposition. Finally, both the characters win their respective love interests and respect with their interest shown in social service. This War of Krishna and Arjun together, might not be a block-buster but surely not a lack-lustre.